I have a PeopleSoft Finance Application that runs queries.Few large tables have to be partitioned to improve performance on the queries.Those partitioned tables get updated on partition key during regular business operations.Hence i have to keep row movement enabled on the Partitioned table to achieve that.My specific question is ,is there any downside if we keep the row movement enabled permanently on the partitioned table? Row movement permits operations that might move a row to a different block. Effectively the row is deleted and reinserted, and the overhead is additional redo and undo that that incurs. 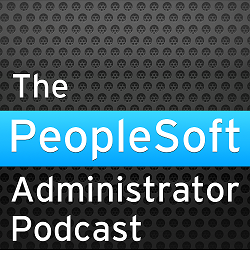 In practice, there are few things that will happen during normal PeopleSoft operation that will incur this overhead. However, if you don't enable row movement, you won't be able to do certain administrative tasks. Whenever I have partitioned tables in PeopleSoft I have usually enabled row movement. However, one word of caution. Partitioning ledger tables by FISCAL_YEAR and ACCOUTING_PERIOD is simple and safe. Partitioning other tables needs careful consideration and testing. It depends on the nature of the data and processing, and that varies from customer to customer. For example, Partitioning by BUSINESS_UNIT and SETID makes good sense in terms of the SQL generated by the application, but you frequently find most of the data in a very few data values. I frequently see JRNL_LN partitioned by JOURNAL_DATE, and I don't think that this always a good idea. You guessed it right David,I have to partition the PS_JRLN_LN table and PS_VCHR_ACCTG_LINE table by JOURNAL_DATE because my end users have made PSQUERIES in the front end using JOURNAL_DATE.We started having major performance issues for those PSQUERIES and i had to partition both the tables using JOURNAL_DATE.In PS_VCHR_ACCTG_LINE ,JOURNAL_DATE can be a null and hence i had to use Range Partition(Interval Partition does not accept NULLS).Those null values get updated by subsequent business processes and hence i had to enable row movement.I have not been able to talk down the user to use anything apart from JOURNAL_DATE. I would like to know from you why you feel partitioning by JOURNAL_DATE is not a good idea .If front end queries use JOURNAL_DATE as a criteria do i have any other option apart from partitioning on JOURNAL_DATE to better the performance.? If you are planning to partition several tables, I would suggest you look at Managing Oracle Table Partitioning in PeopleSoft Applications with GFC_PSPART Package (http://www.go-faster.co.uk/gpdoc.htm#Configuring_Operating_Streamed_Payroll). The package is on Github at https://github.com/davidkurtz/gfcbuild. I don't believe that there is a generic answer to your question. It depends. Please contact me directly to discuss this further.